The emergence of ultra-intense and ultrashort laser system makes it possible to attain the extreme conditions in the laboratory like ultrastrong electric field, ultrahigh magnetic field, ultrahigh energy density, and gigantic light pressure, which are otherwise found only in the interior of a star or the edge of a black hole. It has largely promoted the development of a number of basic and frontier interdisciplinary subjects including laser science, attosecond optics, and plasma physics. Ultra-intense ultrashort laser applications have made some progress in studying antimatter, proton imaging, and driving the wake field electron acceleration. At present, the main technology of constructing ultra-intense and ultrashort laser facility in the world is chirped pulse amplification technology(CPA). Ti sapphire crystal is usually chosen as terminal amplifier in the laser facility based on CPA technology. In order to further improve the peak power of laser pulse, a larger Ti:Sapphire crystal with high quality is required. The research team led by Yin Hangfrom Shanghai Institute of Optics and Fine Mechanics, Chinese Academy of Sciences, used heat exchange method (HEM) to grow a Ti:Sapphire crystal with a diameter of 235 mm and a thickness of 72 mm. 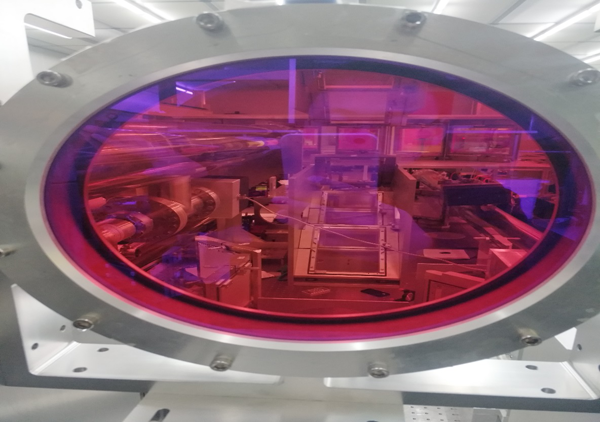 (the largest Ti:Sapphire crystal ever reported for a petawatt femtosecond-class laser system). Optical and laser properties were measured. The measurement results show that the crystal has good absorbability for 527 nm green light. Figure of merit (FOM) value is high. Internal quality of the crystal is better. And small signal gain value with high uniformity is obtained. The results have been published in Chinese Optics Letters, Vol 16, Issue 7, 2018 (H. Cao et al., Optical property measurements of 235 mm large-scale Ti:Sapphire crystal). Huang Pei, a member of the research team, thinks that the study demonstrates that the large Ti:Sapphire crystal has excellent optical properties and laser performances, which can further support higher peak power of the laser pulse output. Based on the above research results, the next step will be to increase the input energy and test the gain under large input energy.